Scrum is the most popular Agile framework. It is an adaptive, iterative, fast, flexible, and effective methodology designed to deliver significant value quickly and throughout a project.Scrum ensures transparency in communication and creates an environment of collective accountability and continuous progress. 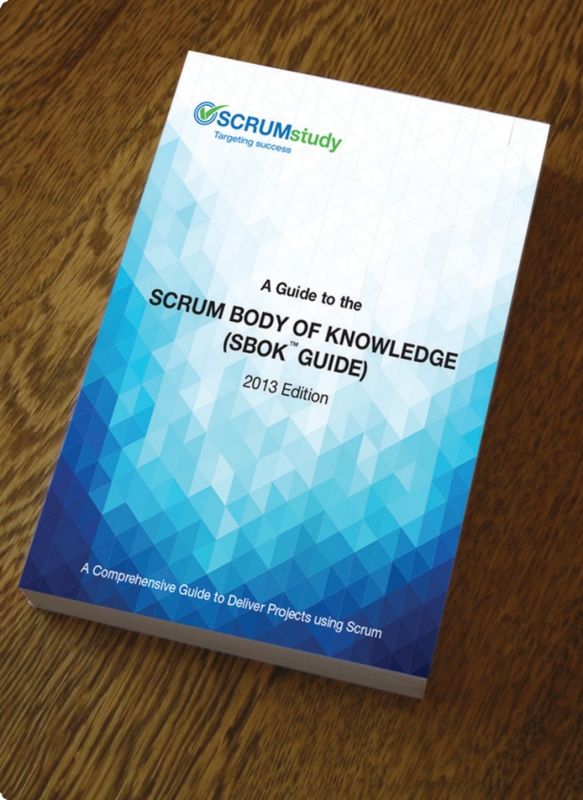 The Scrum framework, as defined in the SBOK™ Guide, is structured in such a way that it supports product and service development in all types of industries and in any type of project, irrespective of its complexity. A Scrum project involves a collaborative effort to create a new product, service, or other result as defined in the Project Vision Statement. Projects are impacted by constraints of time, cost, scope, quality, resources, organizational capabilities, and other limitations that make them difficult to plan, execute, manage, and ultimately succeed. However, successful implementation of the results of a finished project provides significant business benefits to an organization. It is therefore important for organizations to select and practice an appropriate project management methodology. A key strength of Scrum lies in its use of cross-functional, self-organized, and empowered teams who divide their work into short, concentrated work cycles called Sprints. The focus of Scrum on value driven delivery helps Scrum Teams deliver results as early in the project as possible. Empirical process control and iterative delivery make projects adaptable and open to incorporating change. All information radiators like a Scrumboard and Sprint Burndown Chart are shared, leading to an open work environment. Continuous feedback is provided through the Conduct Daily Standup, and Demonstrate and Validate Sprint processes. The deliverables are improved progressively Sprint by Sprint, through the Groom Prioritized Product Backlog process. due to collaboration of cross functional teams. due to time-boxing & minimizing non-essential work. The Create Prioritized Product Backlog process ensures that the highest value requirements of the customer are satisfied first. The Conduct Daily Standup and Retrospect Sprint processes lead to greater levels of motivation among employees. The Create Prioritized Product Backlog process and regular reviews after creating deliverables ensures effective deliverables to the customer. Conduct Daily Standup and Retrospect Sprint processes promote transparency and collaboration, leading to low friction among employees. The Approve, Estimate, and Commit User Stories process allows team members to take ownership of the project and their work leading to better quality. Iterative processes enable the continuous delivery of value through the Ship Deliverables process as frequently as the customer requires. A collaborative framework enables highly skilled cross-functional teams to achieve their full potential and high velocity. The Retrospect Sprint and Retrospect Project processes create an environment of introspection and learning leading to innovation and creativity. The Google AdWords team uses Scrum to develop innovative features at a rapid rate.Scrum has come a long way since its inception in the mid 80’s. In the present day, Scrum is one of the most widely applied project management frameworks globally. Also, the widespread increase in the demand for certified Scrum Masters and Scrum Experts is a testimony to the fact that Scrum will expand its domain in the years to come. The prevalent misconception is that Scrum is suitable for and used by only the Information Technology sector to develop software and product applications and services. Nonetheless, surveys done over the past decade have revealed that Scrum is, no doubt, applied most in managing software development projects; however, it is equally suitable for and successful in fields such as Finance, healthcare, Automotive, and Construction. The Google AdWords team uses Scrum to develop innovative features at a rapid rate. GE allocates 60% of its program spend for Agile projects. The path-breaking Apple products are a result of their project teams using Scrum. com used Scrum to affect a dramatic turnaround in its fortunes. The figure below shows that Scrum is increasingly being applied outside of the traditional IT industry. Because of the ever-evolving technology and ever-changing socio-economic conditions, project management needs a framework like Scrum, which is highly adaptable and change-friendly. Another reason for Scrum to have become widely popular is that the size of the company is no constraint in adopting the Scrum framework for project management. The figure below shows the distribution of companies by employee count. Thus, Scrum is being used for project management across industries, irrespective of the number of employees, the region or the country where it is located, and the nature of the project. Being an Agile approach, Scrum can be tailor-made for any project. • Product Owners who want to fully understand the Scrum framework and particularly the customer/stakeholder-related concerns involving business justification, quality, change, and risk aspects associated with Scrum projects. • Scrum Masters who want to learn their specific role in overseeing the application of Scrum framework to Scrum projects. • Scrum Team members who want to better understand Scrum processes and the associated tools that may be used to create the project’s product or service. 2. As a comprehensive guide for all Scrum practitioners working on Scrum projects in any Organization or industry. 3. As a reference source for anyone interacting with the Scrum Core Team, including but not limited to the Portfolio Product Owner, Portfolio Scrum Master, Program Product Owner, Program Scrum Master, Scrum Guidance Body, and Stakeholders (i.e., sponsor, customer, and users). 4. As a knowledge source for any person who has no prior experience or knowledge of Scrum framework but wants to learn in details about the subject.